Let's run from the haze and go for a holiday! When was the last time you did sometime for yourself? Book your holiday now at Zuji and get up to $100 off flights and packages when you pay by MasterCard! Also get a 12% hotel code and free travel insurance. Promotion is valid till 1 November 2015. Act now and start planning for that holiday! Take up to $100 off these return fares! Exclusively for MasterCard cardholders. 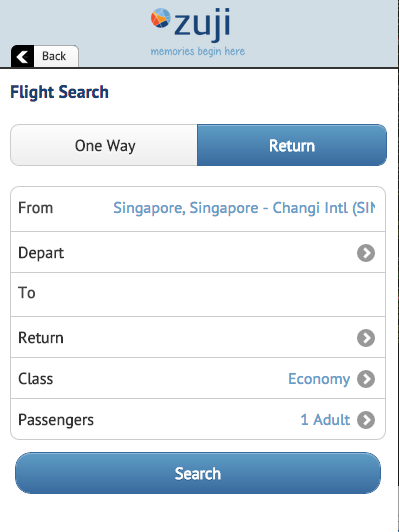 To qualify, a flight or package booking must be booked on www.zuji.com.sg between the “Promotion” Period using a MasterCard. Departure must be from Singapore and date of departure must not be after 31 March 2016. ZUJI booking fees will not be considered in the calculation of the minimum spend amount. A MasterCard must be used to complete and pay for the flight or package booking. Customer must complete and submit the rebate claim form in order for his rebate to be processed. Upon validation, customers with successful claims will receive the rebate in their credit card statement within 30 days from the date of submission. 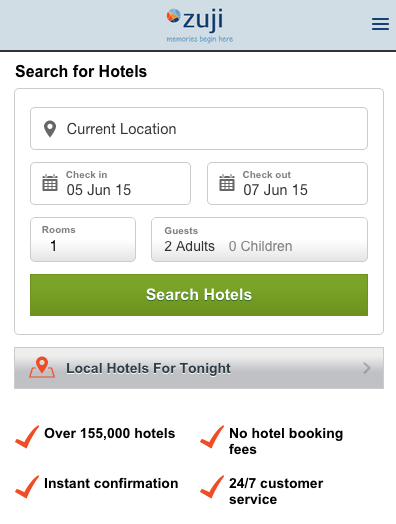 To qualify, a hotel booking must be booked on www.zuji.com.sg between the “Promotion” Period using a MasterCard. The hotel coupon code is only travel for hotel stays by 31 March 2016. A valid MasterCard must be used to complete and pay for the hotel booking. Utilization of the coupon codes by non-qualified cards will result in the booking being charged the discounted amount. The coupon code must be entered at the payment page in order to enjoy the 13% discount. The Coupon Code cannot be used for hotel reservations at properties belonging to the following chains: (a) Accor Hotels (Accor Hotels, Pullman Hotels and Resorts, Sofitel, Ibis, Mercure, Grand Mercure, All Seasons, Novotel, Mgallery, hotelF1, Formule, Sea Temple, Quay West, The Sebel and Citigate), (b) Hilton Hotels Corporation (Conrad Hotels and Resorts, Hampton Inn, Hilton Garden Inn, Hilton International, Double Tree by Hilton, Embassy Suites, Homewood Suites by Hilton and Waldorf Astoria Hotels and Resorts), (c) Intercontinental (ANA Hotels, Crowne Plaza Hotels, Holiday Inn, Hotel Indigo, Intercontinental Hotels, Special Properties, Staybridge Suites and Candlewood Suites), (d) Marriott International (Bulgari Hotels & Resorts, Courtyard by Marriott, Marriott Hotels, JW Marriott, EDITION, Marriott Vacation Club, Renaissance Hotels, The Ritz-Carlton, Fairfield Inn & Suites by Marriott, SpringHill Suites by Marriott, Residence Inn by Marriott and TownePlace Suites by Marriott, (e) Starwood Hotels & Resorts Worldwide (aloft Hotels, Le Meridien, Luxury Collection, Sheraton Hotels, The St. Regis, W Hotels, Westin Hotels and Resorts and Element Hotels), (f) Shangri-La Hotels and Resorts (Shangri-La Hotels, Shangri-La Resorts, Traders Hotels and Kerry Hotels), (g) Chatrium Hotel & Residence, (h) Hansar Group, (i) Marina Bay Sands, (j) Venetian Macau Resort (k) Sands Macao Hotel, (l) Banyan Tree Macau, (m) MGM Macau, (n) Carlson Hotels (Country Inn & Suites, Park Inn, Park Plaza, Radisson), (o) Fairmont Hotels (Fairmont Hotels, Raffles, Swissotel), (p) Hyatt Hotels (Andaz, Grand Hyatt, Hyatt, Hyatt House, Hyatt Place, Hyatt Regency, Park Hyatt), (q) Langham Hospitality (Eaton Hotel, Langham Hotels & Resorts, Langham Place), (r) Melia Hotels International (Gran Melia, Innside, Me by Melia, Melia Hotels & Resorts, Paradisus Resorts, Sol Hotels). In the event that another promotion on zuji.com.sg offers a higher discount within the same period, for the same product, with the same promotion criteria, the higher discount will be applied to the booking. The discount value will not be refunded. Booker must select and check the travel insurance option in his flight booking to be entitled to the free travel insurance. Each qualified booking is eligible for a complimentary travel insurance, up to a value of $25 per booking. A valid MasterCard must be used to complete and pay for the flight booking. This Coupon Code cannot be used with another Coupon Code. Check out other travel promotions here!